Powers/Abilities: Fascination's main offensive power is an ability to cause people to experience distortions in their perception of time - typically this causes their minds to shut down under a kaleidoscopic bombardment of strobing images made up from their own memories. Her victims find that "Seconds stretch into centuries, aeons condense into instants". She normally touches her victim's heads to do this, but as she demonstrated in Excalibur Special Edition#1 when she employs her ability against the phased Shadowcat, she doesn't actually have to make contact to use this power - she can use it from a short distance away. She may also have a level of superhuman strength, although exactly how strong is unsure (certainly enough to take on the Fury hand to hand or to lift the unconscious Brian Braddock with ease). She is able to project some form of energy beam when her main attack fails to work, as in the battles against the Tribunal's robots or the Fury. She is able to fly - she typically floats a few inches off the ground rather than walking, but can fly faster and higher when she desires to do so. Fascination feeds empathically off strong emotions, and given comments made in Captain Britain#12 (when she was working with the Technet) that she would not join the Special Executive for another three hundred years, it seems likely she is also extremely long lived, if not actually immortal. Her sense of smell (or something approximating it) appears to be incredibly powerful, allowing her to track people and items across continents (Gatecrasher says in CB II#12 that this is how Fascination located Captain Britain in 20th century Russia when she was sent to collect him). She is seen to be able to teleport herself and others through time - this appears to be an innate ability rather than something provided by one of her associates (Yap or Gatecrasher), as her team-mates are unconscious when Fascination is sent through time and space to collect Captain Britain (and Fascination is not smart enough according to Gatecrasher to utilise advanced technology). History: (Dr. Who anthology: Walking in Eternity - p285 - 287: "Executive Action" (fb)) - Rassilon of Gallifrey, seeking to save his people from their curse of infertility, devises great Looms of genetic material whereby he can decant new Gallifreyans. He experiments with the mix to begin with, producing unusual genetic variations (parahumans) in the prototypes, before finally settling on a standard form for his new breed of Gallifreyans. The new breed are generally known as Loom Borns (as opposed to the original Womb-Born Gallifreyans), but neither group sees the prototypes as being part of them. One of these prototypes, Fascination, will eventually suggest that they call themselves The Bastards of Rassilon. (bts) At some point Fascination falls in with a group of interdimensional time and space mercenaries known as The Technet, led by a being known as Gatecrasher. (Captain Britain II#4) - Captain Britain is confronted by Gatecrasher's Technet. When he first sees the team, he recognises Fascination, and at first thinks they are his former allies, the Special Executive, but he is swiftly corrected. This is Fascination from an earlier point in her history, and his previous meeting with him i in her future. (Captain Britain II#5 (fb)) - The interdimensional mercenaries soon realise that Captain Britain is not their real prey, Kaptain Briton, but instead his counterpart from this reality. Fascination however still seems pleased to see the hero, perhaps aware of their other (her future, his past) encounters, perhaps just drawn to his strong emotions. Yap, the team telepath, locates their real prey, in the direction of Braddock Manor, and Captain Britain, fearful for his sister, takes off at high speed. The Technet teleport after him, though not before their presence is observed by agents of RCX. (Captain Britain II#5) - Arriving in Braddock Manor, the Technet encounter Meggan and Betsy Braddock. Gatecrasher sends Fascination to gather the Manor's remaining inhabitants, Emma Collins and Alison Double, to her, and then explains the reason for their presence. When the two Brit's finish their battle, the Technet gather up the loser, whom they believe to be their quarry, and depart for Earth-794, little realising that Briton has duped them and they have the wrong man. (Captain Britain II#6) - The Technet are preparing to depart from 794, home of The Empire of True Briton, planning to head to the Were-Worlds with their payment of dragon scales, when Captain Britain catches up with them and convinces them of their mistake. Before they have a chance to do anything about it though, Sat-Yr-Nin, the tyrant who hired them to retrieve Kaptain Briton, sends her troops after the hero. Fascination and the rest of the Technet take on the dictator's forces and wipe them out, then leave the benighted world. (Captain Britain II#7) - Fascination watches as Gatecrasher teleports Captain Britain home. (Captain Britain II#12 (fb)) - Fascination and her team-mates arrive at the Were-Worlds at the worst possible time, Full Moons, when the natives' lycanthropy comes to the fore, and the squad is forced to fight their way out. One of the team dies in the escape. The Technet hold a wake at the Ragrock Bar, a reverie which is interrupted when a group of Berserker Pirates turn up. Gatecrasher kills their leader after he lewdly propositions her, and in reparation is forced to hand over every penny the Technet have. With the exception of Yap and Fascination, the rest of the Technet quit and accept an offer to join the Special Executive, a team largely consisting of Rassilon's prototypes (and used by him to do his dirty work). The Executive also make a number of offers to Fascination to enlist in their band, but loyalty keeps her with Gatecrasher. Seeking to drown her woes, Gatecrasher and her much reduced company live up to her name and gatecrash a celebration held by the despot of Kandahar. The Despot mentions to Gatecrasher about an item he desires for his collection, an artifact located in 13th century Peru in an Incan city doomed to be destroyed by an earthquake. Yap locates the desired object using his psychic powers, and then teleports Fascination to the location, a treasure room, to collect it. However Fascination, being of a limited intellect, continually brings back the wrong items, as she does not know the scent of the one she is meant to purloin. Accordingly Gatecrasher finally travels to Peru herself, passing the three of them off to the natives as visiting gods. The natives trick their visitors however, poisoning their food with parasite eggs which will eat them from the inside. 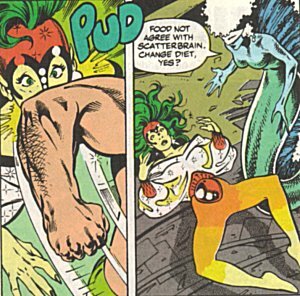 Fascination escapes this fate, as she feeds off the excess emotional energy of sentient beings and thus had not eaten anything, so just before Gatecrasher passes out she telepathically instructs Fascination to fetch Captain Britain's aid. (Captain Britain II#11) - Fascination catches up with Captain Britain and Meggan in 20th century Russia, and teleports them to the Incan Temple. (Captain Britain II#12) - Fascination delivers her somewhat disoriented charges to Gatecrasher, who is sitting under a waterfall inside the Incan temple, using the cold to keep the parasite eggs from hatching. The empathic feeder hovers around the irate hero (presumably feeding) as Gatecrasher explains her predicament, then asks him to fetch the cure. Fascination remains with her mistress until he returns, in the nick of time before the earthquake. Back on their ship, Gatecrasher returns Captain Britain and Meggan to their own time, then she, Yap and Fascination return to their travels. (bts) Nearly three centuries pass for Fascination. At some point during this she begins to answer to the codename Scatterbrain. 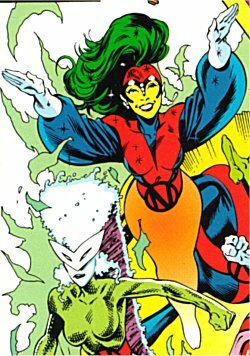 (bts, mentioned in Excalibur I#42) - Gatecrasher is commissioned by Saturnyne to capture Phoenix (Rachel Summers), deemed a threat to reality. The giant mercenary uses the lure of shares in the large reward to reform the Technet, gaining some new members and either regaining most of the old or convincing virtually identical members of the same species to replace them. (Excalibur Special Edition#1: The Sword is Drawn) - Gatecrasher and Yap confront Meggan, Nightcrawler and Shadowcat on Muir Island, but when they state their intention to help Phoenix evade arrest, Yap teleports the rest of the Technet in. Shadowcat's insubstantiality doesn't protect her from Scatterbrain's time distortion abilities, and the young mutant is rendered unconscious; Meggan is also apprehended, but Nightcrawler manages to teleport away. Continuing their hunt, the Technet teleport to London's Post Office Tower, where Yap's scans pinpoint Phoenix. They catch up with her in a quiet street, and the element of surprise allows for a swift capture. Before they can depart though, the Warwolves, agents of Mojo who also seek Phoenix, launch an assault. Since her canine foes are immune to psi-powers, Scatterbrain resorts to physical force in the subsequent battle. Things get much more complicated as Captain Britain and Nightcrawler arrive and manage to free their captured friends. Unlike the Warwolves though, Britain is not immune to Scatterbrain's main attack, as she demonstrates by taking him down while he is pounding on Thug. Overall though the tide of battle turns against the Technet, so Gatecrasher deems discretion the better part of valour, and has Yap teleport them away. (bts) - Having been unequivocally told by Saturnyne to return with Phoenix or not at all, the Technet find themselves effectively in exile until they complete their mission. Needing somewhere to base themselves, Gatecrasher and the Technet set up their home on Brighton Pier. (Excalibur I#12) - Nigel Frobisher is sent by Sat-Yr9 (who has secretly replaced her Earth-616 counterpart Courtney Ross) to arrange for the Technet's services. He interrupts Gatecrasher "negotiating" with Brighton's town council to use the pier during their stay on Earth, and is subjected to a number of humiliating transformations by members of the Technet. Scatterbrain hovers round the councillors, much to their concern, although Gatecrasher assures them that Scatterbrain has eaten recently and that they are in no danger. (Excalibur I#13) - The councillors depart, having agreed to let the Technet stay in return for the mercenaries controlling the weather to ensure ideal conditions for tourism. Gatecrasher jubilantly informs the team of this, but they are less than impressed with their new accommodation. As the transformations to Nigel Frobisher wear off, he briefly takes on the form of his boss, eliciting a shocked response from several members of the Technet, Scatterbrain among them, as his employer "Courtney Ross" is the spitting image of Saturnyne. The Technet accept a contract to rescue Jamie Braddock from African ruler Doc Croc. (Excalibur I#15) - Watching a briefing about their new mission, Scatterbrain expresses the opinion that Doc Croc is the first decent looking person she's seen on Earth. Then most of the team teleport to Mbangawi, Doc Croc's nation. They easily penetrate his compound, and while several of the team deal with the guards in the grounds, Gatecrasher, Joyboy, Yap and Scatterbrain enter the building proper. Inside Scatterbrain is left to deal with a particularly large guard, stunning him with her temporal power and feeding off him, while the other three continue the search for their target. A few minutes later Yap teleports the entire team, plus Doc Croc and Jamie Braddock, back to the pier. Gatecrasher has discovered that Jamie Braddock is a sadistic slave-trader, and no longer wishes to rescue him, but Yap, terrified at the power he sensed within Braddock, brought them all home. The Technet are ordered to recapture the now insane Braddock, but one by one fall prey to his ability to pull the strings on reality. Scatterbrain comes at him from behind, intending to simultaneously fire every synapse in his brain, "scattering his consciousness so far across creation it will never re-integrate". This backfires, and Scatterbrain is the one who is "psychically fried", while Braddock is returned to a level of lucidity. Wearing the downed parahuman like a cloak, he finishes off the rest of the squad with ease. Then he returns them all (but not Doc Croc) to normality, wiping their memories of their fight with him. They are left watching Roseanne, believing their mission to have been a total success. (Marvel Comics Presents#174/2) - Commissioned by Saturnyne to capture Phoenix (Rachel Summers), the Technet traveled to Excalibur's lighthouse. They encountered Lockheed, whose fiery attacks kept them at the disadvantage, so Gatecrasher ordered Yap to teleport the small dragon away. Lockheed was teleported to Dinosaur World, but the dimensional flux beneath the lighthouse opened a two-way door to that realm, and Devil Dinosaur appeared in the lighthouse. The Technet had little luck against the mighty T. Rex: Scatterbrain fired all of his synapses at once, but this pretty much had no effect, since the big reptile had a brain the size of a pea. Eventually, Yap managed to restore Lockheed and Devil Dinosaur to the rightful realms. Shadowcat arrived just as the Technet was teleporting away. (Excalibur I#42) - Months of unintended exile to Earth seems to have unhinged Gatecrasher's mind; Fascination and the rest of the Technet watch their leader cackling insanely over her newest creation, a "mega-weapon" which will allow them to defeat Excalibur, capture Phoenix, and thus finally leave the Earth. A little after dawn the Technet watch as Gatecrasher's weapon, a sentient bomb named Hard-Boiled Henry, blows up Excalibur's lighthouse home, with the team of heroes standing at ground zero. Yap then teleports them all into the wreckage, and back out with the unconscious members of Excalibur. Shadowcat is still awake though, and starts to fight back, preventing the Technet from taking their prize, until Scatterbrain knocks her out. Unfortunately for the mercenaries this has delayed them just long enough for the rest of the heroes to awaken, but the mercenaries manage to retain the upper hand over the somewhat disoriented Excalibur...until an arriving temporal operative from Otherworld places them in stasis. When that operative departs, he gives Excalibur five minutes headway before the Technet are freed from stasis, allowing the heroes to reposition the mercenaries so that their attacks will strike each other. Scatterbrain in particular is placed to catch Gatecrasher with her mind-warping power, although the Technet leader proves to be the first individual seen who isn't rendered senseless by this attack. Faced with a fully recovered Excalibur, the Technet pause long enough for Excalibur to hand over a crystal left by the Otherworld agent; this proves to be a message from Saturnyne cancelling their contract and indefinitely extending their exile. With the sole exception of Yap, the Technet turn on Gatecrasher, and the team leader flees. The rest of the mercenaries plead for Excalibur to house them in the lighthouse, as they have nowhere else to go; rather than leave them to commit who knows what mischief elsewhere, the heroes reluctantly acquiesce. (Excalibur I#43) - The Technet are helping repair the damage caused to the lighthouse by the explosion, but their presence in his home is getting on Captain Britain's nerves. Presumably sensing his irritation, Scatterbrain starts following him as he walks down the inside of the building, only increasing his annoyance. She is with him when Ferro2 accidentally overloads Kitty Pryde's computers and when he catches Bodybag stalking and eating Kitty's teddy bear. Scatterbrain continues to feed off his excess emotions until Bodybag, who proves to be allergic to the Nylon the bear was made from, seemingly destroys their bathroom, the only one in seventeen miles. Kitty, now the angrier of the two, becomes the one to attract Scatterbrain. She catches up with her original meal at the bottom of the lighthouse, where China Doll is also present. China Doll finally explain to the hero why Scatterbrain is following him around. Having had enough, Captain Britain decides to go to stay elsewhere, but on the way out a mishap occurs and a brawl breaks out between the short-tempered hero and his team mate Nightcrawler. Scatterbrain eagerly moves in to feast, only to get hit in the face by a stray elbow, knocking her senseless. (Excalibur I#44) - Scatterbrain joins in the Technet's regular lunch break brawl. Later on, about the time Dai Thomas and Emilia Witherspoon drop by to ask for Excalibur's help with a case, Scatterbrain and the Technet are watching an episode of Sesame Street. (Excalibur I#45) - Miss Witherspoon, a clairvoyant working with the police, has predicted a museum robbery, and Dai Thomas has asked Excalibur to stake the scene out to catch the thief in the act. Since the rest of Excalibur is absent, and since his leg is in a cast following his brawl with Captain Britain, Nightcrawler reluctantly brings the Technet members along with him. Believing they have spotted the intruder, Scatterbrain and her team mates leap into the fray, but instead end up fighting government agent Micromax, who is likewise staking the museum out. Scatterbrain starts hovering around him (feeding) as he struggles to maintain his cool while asserting his authority over Nightcrawler's team. When their respective bosses arrive and start arguing jurisdiction, Nightcrawler and the Technet take the opportunity to slip away quietly. Back at the lighthouse Nightcrawler watches the Technet have another lunch break fight, and struggles to figure out how to mold them into a more effective team. A little later, at another stake out, Micromax is caught by surprise by the invisible thief and rendered unconscious. This time however, Nightcrawler and the Technet are more prepared; garbed in team colours, they launch a co-ordinated assault on the thief. Once others have made it visible and immobilised it, Scatterbrain moves into to try and incapacitate the demonic-looking criminal. She discovers the beast has a dead mind, controlled by another too far away for her power to affect. Joyboy starts using Scatterbrain as a conduit to channel his power through to affect the controlling mind, but that mind fights back, and the Technet are barely able to hold their own, until China Doll adds her power to the fray, tipping the balance. The thief, it's link to its master broken, is reduced to a tiny statue, and the Technet return to base, happy that they are now a proper team. (Excalibur I#46) - Scatterbrain is among the Technet gathered around Excalibur's scanners, trying to locate Joyboy, who has been missing since the battle at the museum. In their concern they are virtually oblivious to the arrival from another dimension of Kylun. They do notice some loud noises a little later, but when they rush to investigate, it turns out to just be Widget, an associate of Excalibur, whose robotic form is now growing legs. As they relax their guard, they are sent flying by an explosion which precedes the appearance of another visitation. (Excalibur I#47) - Scatterbrain joins the rest of the Technet in attacking the newcomer. She is sent flying by a blast from it, just prior to the fight being interrupted by a flight of tiny dragons (one of the Technet, Numbers, has successfully mated with a dragon from another dimension - don't ask). This gives Nightcrawler time to call a truce with the visitor, who proves to be an armoured woman named Cerise. The German mutant introduces her to the Technet. Cerise senses another disturbance, this time from outside the lighthouse, presaging yet another otherworldly arrival. Everyone races outside, where they witness the materialisation of the Special Executive. After a swift negotiation, the former Technet members join the Executive, effectively circumventing their order of exile, and following extremely brief farewells, they depart. (Excalibur I#125) - Scatterbrain was present with the rest of the Technet at the wedding of Brian and Meggan Braddock. She was one of the single women contending to catch Meggan's bouquet, but the flowers ended up in the hands of Kitty Pryde. (Fantastic Four III#8-bts) - Technet were hired by Opal Luna-Saturnyne and Roma to bring Franklin Richards to them, so they could better teach him how to use his powers, and more importantly protect the universe from him. (Fantastic Four III#6) - Along with the rest of Technet, Scatterbrain interrupted the Thing, Franklin Richards and Alyssa Moy at dinner. Using teamwork, Technet was able to defeat the Thing, after China Doll shrunk him, Scatterbrain discombobulated him, and Thug KOed him. Franklin and Alyssa were able to escape in the carnage. (Fantastic Four III#7) - The Fantastic Four were able to catch up to Franklin and Alyssa, but Technet weren't far behind. Scatterbrain used her powers to scramble Reed Richards' mind, but he was able to fight through it, and tossed her at Thug, knocking them both out of action. (Fantastic Four III#8) - After the arrival of the Captain Britain Corps, Technet decided they were in over their head and attempted to teleport away. Yap was knocked out during the fight between the Four and the Captain Britain Corps, and Technet found themselves stuck. Johnny Storm later convinced Opal Luna-Saturnyne that the Fantastic Four would make sure Franklin grew up right, and Technet and the Captain Britain Corps were teleported away. (bts) The Technet again breaks up, and several members return to the Special Executive. Fascination returns to using her original codename. (Dr. Who anthology: Walking in Eternity - p285 - 287: "Executive Action" (bts)) - When the Special Executive leave Gallifrey forever during the civil war between the Loom Born and Womb Born, Fascination is among their number. (The Daredevils#5) - Saturnyne hires the Special Executive, including Fascination, to kidnap Captain Britain and bring him to the Omniversal Tribunal to act as a witness at her trial. Fascination is one of the team of four selected by Wardog to breach Braddock Manor's defenses and retrieve their target. After Zeitgeist has disabled the computer system and he and Cobweb, the Executive's telepath and precog, have dealt with the manor's other inhabitants, the Executive wake Brian Braddock and Wardog declares him a prisoner of the Executive. The hero reacts swiftly and escapes into the darkness of the house to don his costume. Wardog changes tack and tries to reason with him, which works fairly well until he mentions who their employer is. Britain hauls Wardog up by the front of his jacket, and the Executive's leader calls on Fascination's help to subdue the irate hero. She glides forward and brushes her hands against his head. Instantly his mind overloads under a barrage of images from his recent past as her power distorts his perceptions of time, causing it to shut down. Fascination picks up the unconscious superhero and accompanied by her team-mates, carries their target back to their ship, the Sidewinder. (The Daredevils#6) - Aboard the Sidewinder en route to the Tribunal, Captain Britain awakens and starts a fight with Legion and Zeitgeist. Fascination watches but does not join in. (The Daredevils#7) - Captain Britain again goes berserk at Saturnyne's trial, when it becomes clear that the accused is being railroaded. Gigantic robot guards begin materialising, and Wardog reluctantly sends his team in, Fascination included, to assist the patriotic hero. (The Daredevils#8) - The battle continues to rage, but the trial guards are no match for the Executive, who make their escape with Saturnyne and the Captain. They flee back to Earth-616, returning to Braddock Manor to hide out until they can figure out what to do next. Fascination takes an immediate interest in Betsy Braddock's lover, Tom Lennox, much to his irritation. (The Daredevils#9) - Everyone is huddled around the television watching Sir James Jaspers' speech against superhumans. Fascination continues to show intense interest in Tom Lennox, to his (and now Betsy's) continued annoyance - he doesn't realise that she feeds off strong emotions and it is precisely his poor temper she is attracted to. (The Daredevils#10, bts) - Cobweb has a seizure as she perceives the future awaiting Earth-616, but the sound of an energy weapon in the grounds outside the Manor draws most of the Executive, Fascination included, out into the snow where they find Captain Britain and his counterpart Captain U.K. fighting for their lives against the hero-killing Fury. Within seconds of entering the fray, Wardog has his bionic arm ripped out its socket and Legion is dead. (The Daredevils#11) - The battle continues to rage, with Lady Burning Fish and "Sextant" drawing fire. Oxo strays too close, and the Fury cuts him in half as Fascination watches on in horror. She goes berserk, rushing in on her own in spite of Wardog's cries for her to not attack on her own. The Fury senses the threat, but fails to bring it's weapons to bear before the empathic vampire digs her nails into its skull and distorts reality. Realising that its assailant is interfering with its temporal lobe, the murderous cybiote shuts down its brain and reroutes its consciousness. Then it smashes her out of the air and stamps her head into the ground. Luckily for her, first Captain Britain and then Zeitgeist step in, giving her a chance to recover. The Fury finds itself unable to detect the last of these attackers with any of its sensors, confusing it, and the Executive take advantage of this to press home a concerted attack - first the energy projectors (Fascination included) blast it with everything they've got, then as the ground cracked beneath it, Captain Britain and Fascination tackle it and smash it down into the caverns below the grounds. As a cave in threatens to bury them, the two fliers shoot back to the surface, leaving their opponent to be crushed under tons of rock. The Special Executive gather their wounded and dead, and stating that the coming battle is not their fight, they depart. Comments: Created by Alan Moore and Alan Davis. Her appearances as part of the Technet in Captain Britain Vol.2 must come first, because as the Legion/Thug lookalike states in CB II#4 "Fascination? She's our friend now...there is no Special Executive...not yet. War Dog won't even be whelped for another hundred years, and Cobweb is elsewhere." Their adventure on Earth-794 is immediately prior to the debacle on the Were-Worlds where Elmo dies and the group breaks up (Gatecrasher mentions this is their next stop as they are preparing to depart). The Technet splits apart (temporarily) in CB II#12, and are mostly recruited into the Executive, with the notable exception of Fascination. The "Steward", leader of the Executive at this point, mentions she won't join the team for another 300 years, by which time he will be dead and replaced by Wardog - which is what we witness in Excalibur I#47. This places all the Excalibur appearances next (although there must be nearly 300 years between CB II#12 and Excalibur Special#1). Snood informs me that the MCP appearance is explicitly stated as happening just prior to Excalibur I#42, so that's easy enough to place on the timeline. (bts, just prior to Excalibur#125) Scatterbrain, along with the other Special Executive members who used to be part of the Technet are among those invited to the wedding of Captain Britain and Meggan. Arriving in Otherworld, they meet and make peace with their former leader, Gatecrasher, perhaps because enough time has passed to let go of old grudges, perhaps just for the sake of not disrupting the wedding of their friends. For similar reasons Saturnyne lifts the exile she imposed that effects them should they ever work as a group again. Then she offers them a mission for after the wedding to capture Franklin Richards; protests that they are no longer a team fall on deaf ears, and not wishing to anger the Omniversal Majestrix, the Technet reforms for one last mission. That's my best guess for how it works. Going back to Fascination's timeline, after she has been recruited into the Executive, the group flee the Gallifreyan civil war in "Executive Action". Fascination is mentioned as being one of the Gallifreyan Loom Borns, just like Cobweb and Wardog, but this appearance can't predate her membership of the Technet given the above comments about Wardog's "whelping". At the top of the page I've called the character Fascination, and listed Scatterbrain as an alias. Why, when she is called the latter more recently in the comics? Because based on her timeline, she started out calling herself Fascination, and she finished off calling herself that, which makes it her current codename. Scatterbrain was a name used for an indeterminate period in the middle, even if it is the one most familiar to most American fans. Plus I think Scatterbrain is a naff name, and Fascination is much cooler anyway. We are told in Captain Britain II#12 that Fascination feeds off strong emotions, making her a sort of psychic vampire. This may tie in somewhat with her appearance during the Executive's battle with the Fury, where Fascination gains vampiric features when angry - her eyes go from orange to red, her hands become claw-like, and she displays fangs. One of the greatest enemies of the Time Lords during Rassilon's time were the Vampires, so perhaps when he experimented with the Looms to create Fascination, he included some of their DNA in the mix. Fascination is explicitly stated as having come up with the term "the Bastards of Rassilon" and referred to by Wardog as if she was one of their number, making it extremely likely that she is a prototype Loom Born Gallifreyan. How she then ends up as part of the Technet is unclear, but I'd suggest that prior to the formation of the Special Executive to do Rassilon's dirty work, the Gallifreyans employed mercenaries for these jobs, including the Technet. Fascination may have been recruited by Gatecrasher during a mission for the Gallifreyans (in a manner similar to the way Gatecrasher tries to recruit Meggan in Captain Britain II#12) or she may even have been accepted as a form of payment for some service rendered. 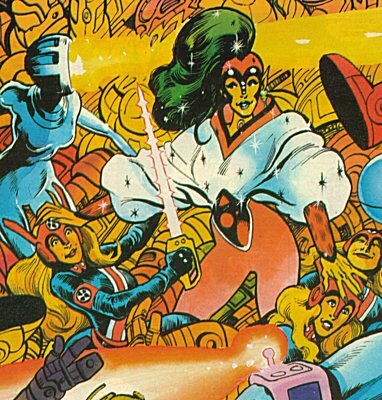 Regardless of the manner of her recruitment, Fascination's heritage also explains why the Special Executive went to such lengths to get her back in CB II#12. Gatecrasher claims that Fascination has an intellect somewhere below an average household pet, a statement which was supported by her general demeanour and lack of dialogue in all her appearances up to this point. However subsequently there are two instances where she is seen to speak. The first is in Excalibur I#13, when she (and the rest of the Technet) collectively gasp "Gatecrasher..LOOK! ", which could be put down to the letterer mistakenly adding a line from the word balloon to her when none should have been there. The second is two issues later, when she describes the cybernetic Doc Croc as "First decent-looking yobbo I've vidded on this orb." This last and Wardog's statement that she is coined the term "Bastards of Rassilon" does imply more intelligence than previously credited, so maybe Gatecrasher was just being rude (not exactly a rare occurrence), or perhaps in the three hundred or so years since we last saw her, Fascination has grown up mentally. Fascination isn't actually seen in any panel of The Daredevils #10, but since the entire chapter takes place in the space of a few minutes sandwiched between two other chapters of similar brevity in which she is visible, it's reasonable to assume she is somewhere just "off-screen" for the duration of it.